I cover parties for the magazine (15 years), so my phone rings here—a lot. I am also a bit of a soft touch and will send you a copy of that fur ad your mother modeled for 30 years ago. These queries inevitably hit on Fridays. Maybe what this fella asked will help you as well. My answer: Each August we publish our hugely popular Best Of issue. The same hat peeps popped up two years in a row – Baron Hats in Burbank. 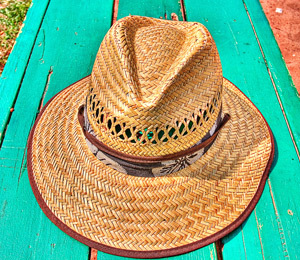 First in the 2008 issue in a “Repair” side note and in 2009 under the category “Best Hat Maker.” Take your soiled remnant of summer in to see if it is salvageable. This caller then went on to ask me if I knew anyone who could replace a concrete driveway. Sorry. But the fastest land animal is the cheetah. Previous articleThe Reading List: L.A. Authors. L.A. Topics. September 09 Books.